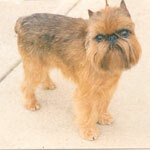 The brussels griffon can be described as a monkey faced looking toy dog breed. The breed was originally bred to hunt and kill mice and vermin from farms, businesses, and property. Today the breed is used as a companion dog as their small size makes them easy to manage and perfect for small apartments and condos. The brussels griffon is an intelligent dog which is very affectionate with their owner. They do best in homes with one or two owners as they tend to attach to individuals rather than groups. The breed can be a bit bossy, but owners that establish themselves as the alpha will get the attention and respect from the breed. 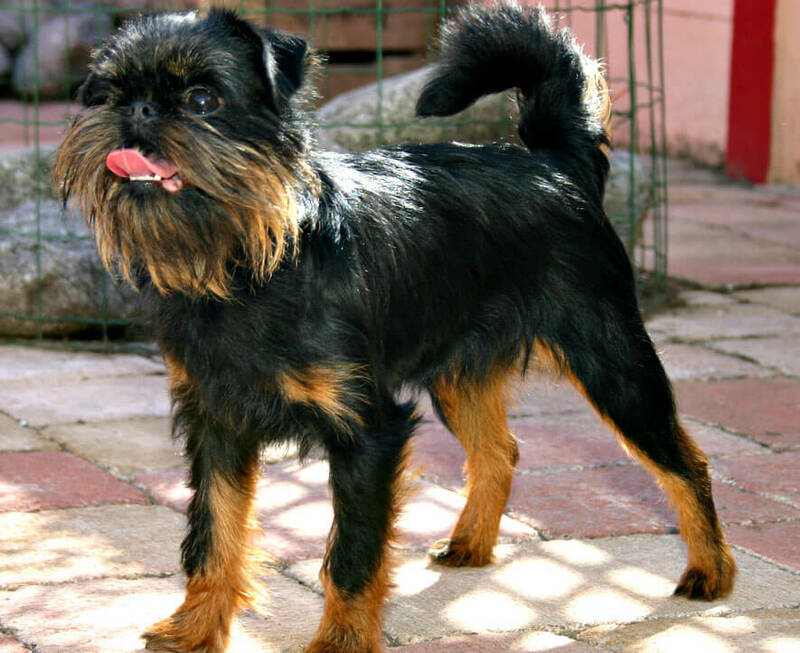 The brussels griffon is a member of the Toy group of dog breeds. Originally developed in Belgium to hunt vermin, this playful, sensitive breed has become better known as a companion animal, and thus is best suited for singles, seniors, and families (though its sensitivity and moodiness may not be a good mix with younger children). The brussels griffon can be described as being unexpectedly heavy for their small size. Even Though the dog can be as short as 7 inches tall, they can weigh up to 12 pounds. 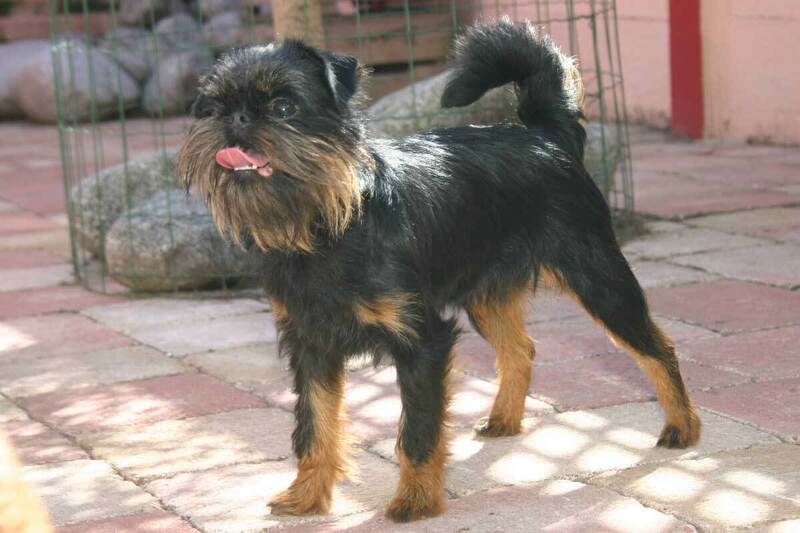 Similar to other small dog breeds, the brussel griffon wants to be with their owner as often as possible. The breed can develop separation anxiety so they generally are not recommended for owners that stay away from home for long periods of time. 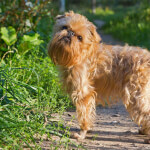 Although the brussels griffon may have the tough dog mentality, they are very affectionate with their family. They can be a bit demanding for attention and have been known to misbehave if the feel unnoticed. It is recommended to socialize the breed at a young age so they can be more well rounded as adults. 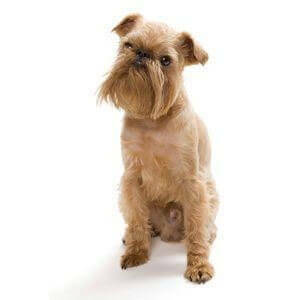 The breed is not recommended for families with younger children as the brussels griffon does not like rambunctious unpredictable behavior, but they do well with other household pets. The first thing most people notice about the brussels griffon is their unique facial appearance. Some people think their face resembles a monkey's face, while others insist it looks like Star Wars characters. This is due to the breeds dense wiry coat on the face. The breed comes in two coat variations which are smooth coat and rough coat. Since the breed is considered a high energy breed, they will need daily exercise to keep their hyperactivity under control. 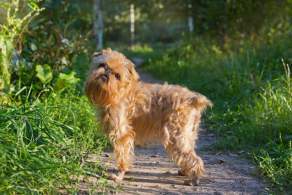 The Brussels griffon had its origin in Belgium, where it was allegedly preceded by a dog called a smousje--a small-sized, wire-haired terrier type used to hunt vermin in horse stables. Beginning in the mid-nineteenth century, Belgian stable owners began crossbreeding the smousje dogs with other imported breeds like the pug, the affenpinscher, and various toy spaniels, apparently in an attempt to develop a more effective vermin-hunting breed. 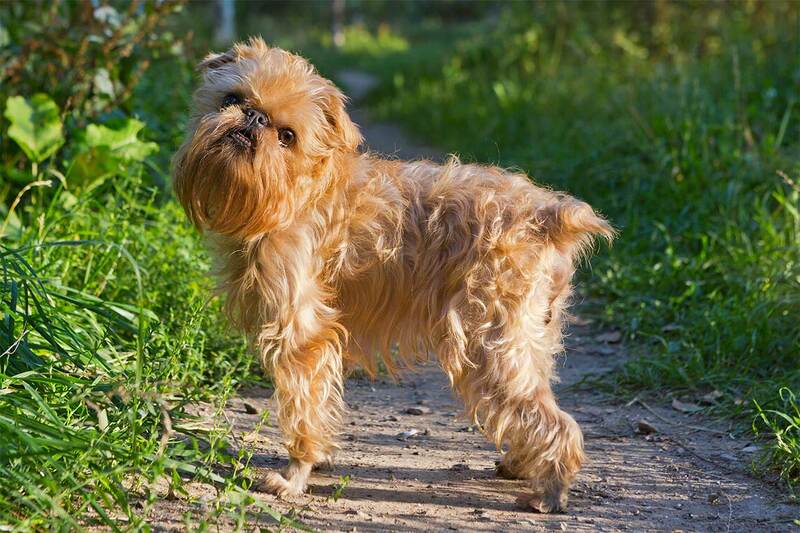 Eventually, the Brussels griffon--or as it's known in Europe, the griffon bruxellois--became recognized as a breed all its own. By the latter 1800s, griffons were growing in popularity, particularly because of Belgium's Queen Marie Henriette, who owned and bred them, thus creating acclaim for griffons across Europe. By 1900, the breed was also well-known in England and the U.S., with Britain's Kennel Club officially recognizing the breed in 1898, and the AKC doing so two years later. By this time griffons also included two sub-types: the petit brabancon, which was a smooth-coated variety, and the Belgian griffon, which was wire-haired but had more variety in its coat coloring (the Brussels griffon was typically red). During World Wars I and II, griffons--as was the case with many dog breeds--shrank greatly in number; dog breeding in general during that time was often difficult and costly, so the world's dog population decreased by a great deal. But a few griffons survived, and the breed's population has increased a bit since the mid-twentieth century. 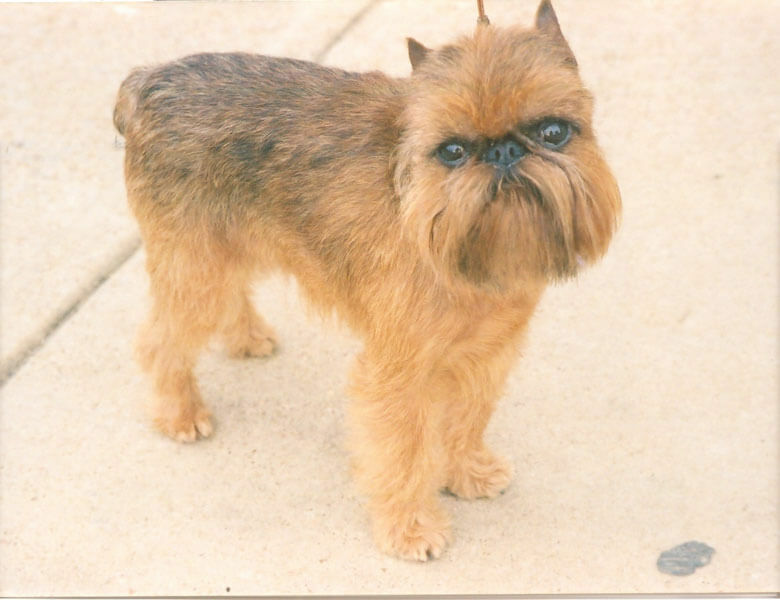 Griffon ownership surged somewhat in the late 1990s, when a Brussels griffon was featured alongside Jack Nicholson in the 1997 film As Good As It Gets. Today, though several breed clubs exist around the world, Brussels griffons are still relatively few in number. Brussels Griffon colors are varied among the three sub-types (the Brussels and Belgian griffons, and the petit brabancon). The true Brussels griffon is usually found in some shade of red; the Belgian griffon can be in a variety of colors including belge (a shade of golden brown; this breed is in fact called the griffon belge in some parts of Europe), black, and most shades of brown; the smooth-coated petit brabancon is most commonly black, though other colors are possible. Brussels griffon size can be a bit deceiving. Dogs of this breed are obviously toy-sized; height at the shoulders is typically 7-8 inches, but these dogs have very solid body structure, so brussels griffon weight averages 8-12 pounds. Some griffons can reach as much as 20 pounds. Size is fairly consistent among the three variations (an average of 7 inches at the shoulders in height and 10 pounds in weight). Some breeders offer smaller "teacup Brussels griffons" for sale--and while those dogs are indeed tinier (as small as 4 inches in height and 6 pounds in weight), they were developed purely by selective breeding, and are not an actual breed variation. In the U.S., only two variations exist: the rough-coated Brussels, which includes the Belgian sub-type, and the smooth-coated petit brabancon. (The American Kennel Club recognizes only the Brussels type.) The breed's native Belgium, meanwhile, recognizes all three variants. 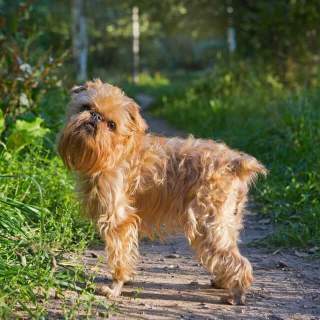 Affectionate, sensitive, active, and at times bossy and quite needy, the typical Brussels griffon temperament is one of pure delicacy. Like some other toy breeds, griffons tend to form a deep bond with one or two family members--usually the ones who show them the most love and affection. The griffon is known as a "Velcro dog" breed, because the typical breed member will stick to one person's side as often as it can. These dogs can also be unusually bossy until they get what they want, and will bark and turn destructive if left alone. Training can be a pleasure--but only if the griffon agrees to learn. They're both intelligent and stubborn, so fun, positive, interactive training methods work best for these dogs. They are also known to be fairly difficult to housetrain. As alert dogs and frequent barkers, griffons usually make pretty good watchdogs (though some can be a bit timid around unknown people). For the most part, griffons will sound a vocal alarm when faced with a potential threat. Griffons can get along fairly well with children, but they mix better with older ones. These dogs can be "fear biters"; if they're treated roughly, shown unwanted affection, or chased--things younger kids tend to do--they're likely to snap at whatever is stressing them. Hence griffons will socialize better with older children, who are more likely to treat them with respect. It's recommended that adult griffon owners teach young kids how to properly handle dogs of this breed. Brussels Griffons tend to socialize well with other animals, though their bossiness may cause them trouble with other dogs (especially larger ones). For best results, it's recommended that owners socialize their griffon with other pets as early and often as possible. 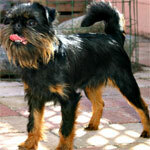 Below are pictures of the Brussels Griffon dog breed. Griffons can be great housemates--for certain people, but definitely not others. They tend to bark often, they can be selfish and bossy, and they easily suffer separation anxiety if ignored. These dogs, therefore, are best suited for owners who can give them a lot of attention. And without question, griffons prefer living inside. They do fine in apartments, and they will not adapt to being left in a yard. Not only will they be lonely outside, they will easily find a way to escape. Brussels Griffons are hypoallergenic, so they're a good match for allergy sufferers. Depending on whether the dog is of the rough- or smooth-coated variety, it will need brushing once or twice a week, combined with a more thorough "hand-stripping" (which is often done by a professional groomer) once or twice a year.